Plants exhibit impressive adaptations to avoid becoming a meal for hungry herbivores. One day, I was sitting in my office with Brian Connolly, a postdoc in the lab, and A.J. Kitchen, an undergraduate researcher. We were musing about how effective the chemical defenses of tomato plants were at reducing herbivory by a generalist herbivore, the beet armyworm: the caterpillars clearly found well-defended tomatoes disgusting, but readily ate less-defended plants. As we joked about how terrible the tomato plants must taste to the armyworms, I wondered aloud whether armyworms might find the well-defended plants to be so disgusting that they would rather eat each other than eat well-defended plants. Although this macabre idea might seem unlikely at first glance, the idea wasn’t really so far-fetched --- many organisms sometimes exhibit cannibalistic behavior, even organisms that generally consume plants. To test this idea, we conducted an experiment where we placed 10 armyworms in a closed container with tomato plants that were or were not well defended. We found that caterpillars paired with well-defended plants started to eat other armyworms earlier in the experiment. As a result, there was much more plant left alive at the end of the experiment. Armyworms paired with plants that did not have induced defenses ate the entire plant, and then started to eat each other. We conducted a second experiment to determine whether there was an additional benefit to the plant, i.e., whether armyworms that cannibalized other armyworms also ate less plant material. Testing this idea required a little creativity, because we needed a way to track cannibalism and herbivory by individual caterpillars, which is a tricky proposition when multiple caterpillars can also eat each other. Stated another way, we needed to find a way to allow armyworms to become cannibals without increasing or decreasing the number of armyworms available to also consume the plant. To solve this challenge, we used flash-frozen caterpillars in a second experiment. These recently killed caterpillars were available to be cannibalized but were not able to eat plant material themselves. 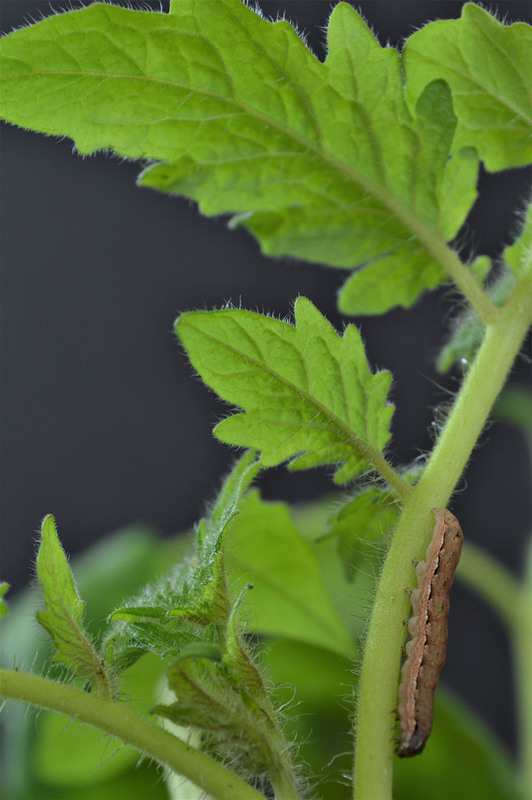 This allowed us to evaluate how having access to poorly-defended or well-defended tomato leaves affected herbivory, cannibalism, and growth by the living caterpillar. This experiment showed that armyworms became cannibals sooner when they were enclosed with well-defended plants, and this led to a drop in the amount of plant material they consumed. Moreover, we found that cannibalism is the optimal behavior for the individual herbivore when faced with a well-defended plant: armyworms that did not have access to dead armyworms ate little plant material and had very low rates of growth. Meanwhile, armyworms on well-defended plants that were able to cannibalize dead armyworms had growth rates identical to herbivorous armyworms on poorly defended plants! This new mechanism of plant defense is unique in that it could represent a win-win scenario that has two benefits for plants. First, armyworms that eat other armyworms reduce the total number of armyworms available to eat the plant. Second, cannibalistic armyworms would fill up on the flesh of their fellow armyworms and thus might not eat as much plant material themselves.